Norwich Falchion - this item is being discontinued and priced to sell !! 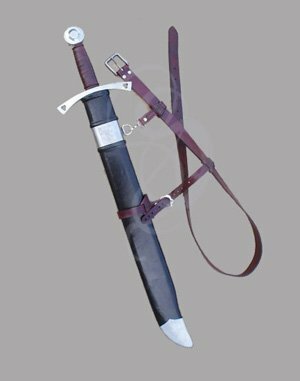 The Falchion is the perfect sword for any Gitan or other warrior cast in the Saladin mould. It is simple to use, and with a simple flick of the hand you are bound to scare any opponent. This type of sabre has always had more weight at the tip of the blade making it particularly effective for attacks that slash side to side. Although the Falchion Messer is usually associated with Arabic warriors it has also been used by English, French and especially German combatants. This sword reflects the medieval period and would suit any character in a fantasy setting.